Big and small fish are great for keeping children happy. Once again, I have prepared a list of five very simple activities that your group is sure to enjoy. Using a single educatall club document, you can prepare all five activities in under five minutes. How great is that? Read on to discover how. For each activity, you will need the following document: (Open models-Fish) Print several copies. Cut out several fish. Color one part of each fish or draw distinct markings on them, creating pairs of identical fish. To play, arrange the fish on a table, upside down. Children can take turns attempting to find matching fish. Prepare a few models in advance. Color one part of each fish or, if you prefer, color each fish completely. Each one must be unique. Laminate the fish. 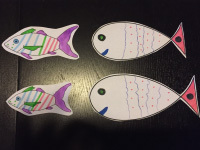 Give each child a fish model and have them reproduce the designs or colors to make their fish look exactly like the provided model. Modeling dough is great for putting tiny fingers to work. Try this simple trick: laminate a few fish that you have printed. 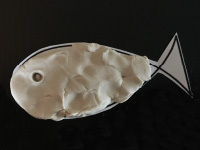 Have children press modeling dough inside the fish outlines to add a touch of color and/or texture. 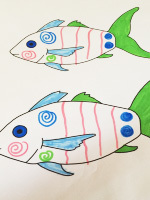 On each fish, draw a certain number of black dots (1 to 10 dots). 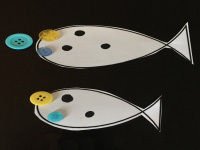 Arrange the fish in front of your group and provide bingo markers, buttons, or pompoms. Children feed the fish, giving each one the corresponding number of pellets. For example, they must give five pellets to the fish that has five black dots.